Wednesday Webhits: How Many Career Goals Can AO Score? Home / Analysis / Wednesday Webhits: How Many Career Goals Can AO Score? 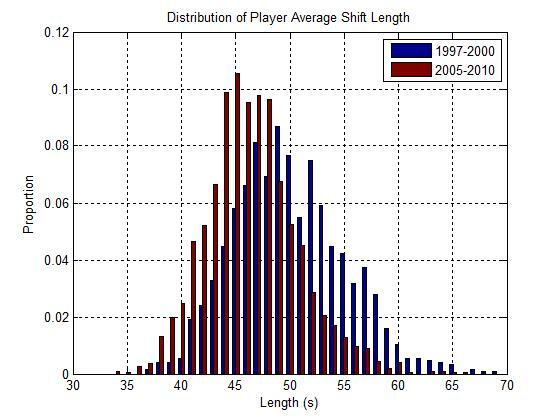 This week we look at Alex Ovechkin’s chances of going down as the greatest goal-scorer in NHL history, a break-down of last week’s big Kovalchuk trade, a look at the change in average shift length for today’s players versus those from 10 years ago (with a certain Capital being a rare exception), and busting a few common myths using the Vancouver Canucks as an example. I had to wrangle these links up quickly, since I forgot what day it was. That’s when happens when you’re snowed in for almost a week without seeing the outside world. At least I had my spreadsheets to keep me busy. Alex Ovechkin: will he be the all-time goal-scoring leader? And 650 goals is nothing to sneeze at. A nice analysis of the trade between the Thrashers and the Devils. The conclusion seems to be that Atlanta did fine on getting back equal total value, but didn’t get that one big piece that would have made it a win for them. Ovie is actually a bit of an outlier, in that his shift lengths have been up over 65 seconds the last couple years. “Myth No. 1: Teams play worse as a road trip lengthens. There is no tendency for teams to play worse as a road trip lengthens. Yes, it is true that road teams are less successful than home teams, but that is only exacerbated when a team plays back-to-back games. On average, road teams have been outscored by 0.3 goals per game this season. But road teams playing for the second night in a row are outscored by 0.55 goals. Luckily for the Canucks, only three of their 16 games are back-to-back.